… History, Heritage and Craft…….Ballydougan Pottery is located at Bloomvale House, an historic grade II listed thatched House circa 1785, once a centre for processing and dispatch of locally produced Linen. It has been sympathetically restored and renovated and is now home to Ballydougan Pottery. 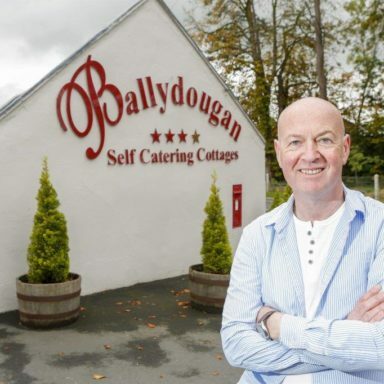 In terms of facilities and experiences Ballydougan is truly special and unique. In our Gift Shop we sell a comprehensive range of our own Pottery plus other Crafts and Gifts; our Restaurant & Coffee Shop serves Breakfast, Morning Coffee, Lunch & traditional Afternoon Tea, all served on our own hand-thrown Pottery; In the Pottery Workshop our team of Potters carry on the tradition of creating hand-thrown Pottery, plus we also offer Group Demonstrations and Individual and Group Pottery Classes throughout the year. For those who wish to stay a little longer we also have a claghan of 5 Self-catering Cottages on site.